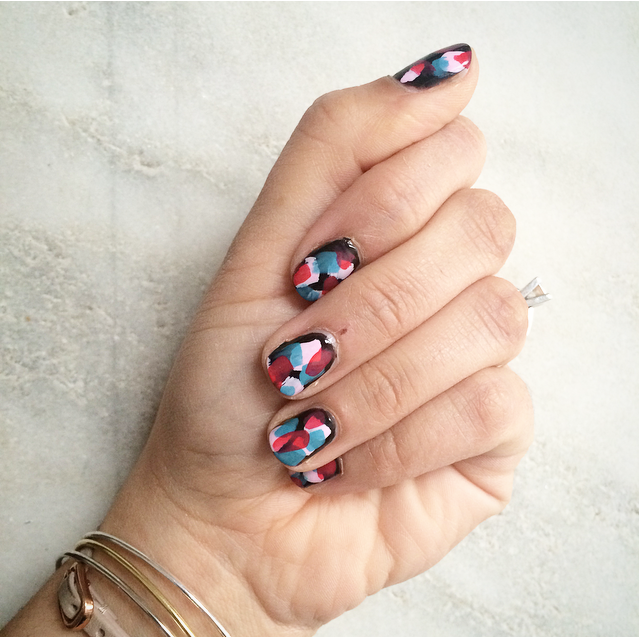 Finally a midweek manicure! It’s been a while. These were inspired by a post I saw on Sally Hansen’s Instagram feed. The design is nice and bright and colorful. Finally it’s starting to feel like Spring around these parts. 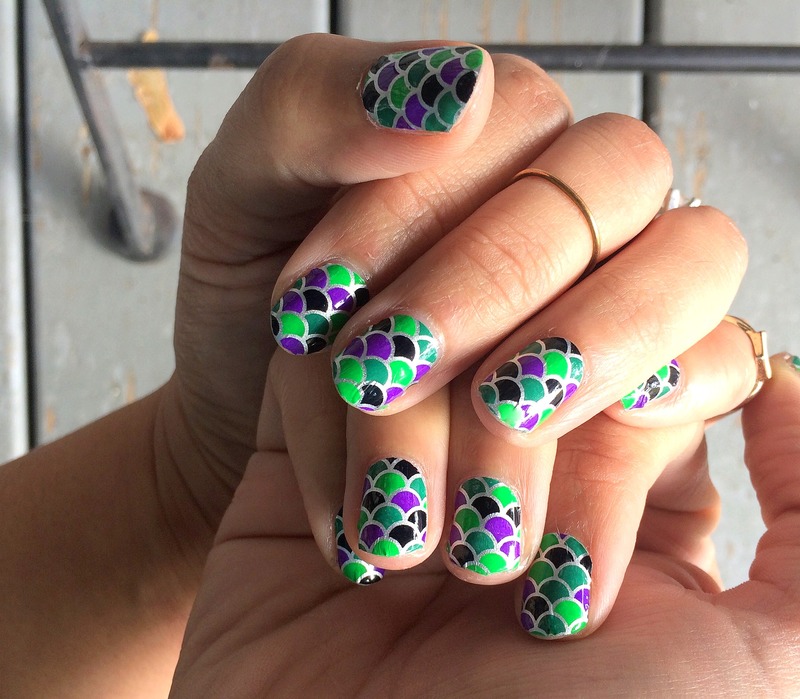 You could do this with any combination of colors you like. I started with a base coat of China Glaze Liquid Leather, then added random brush strokes of each color, one layer/color at a time. I just kept it really loose and random. I love how it turned out. 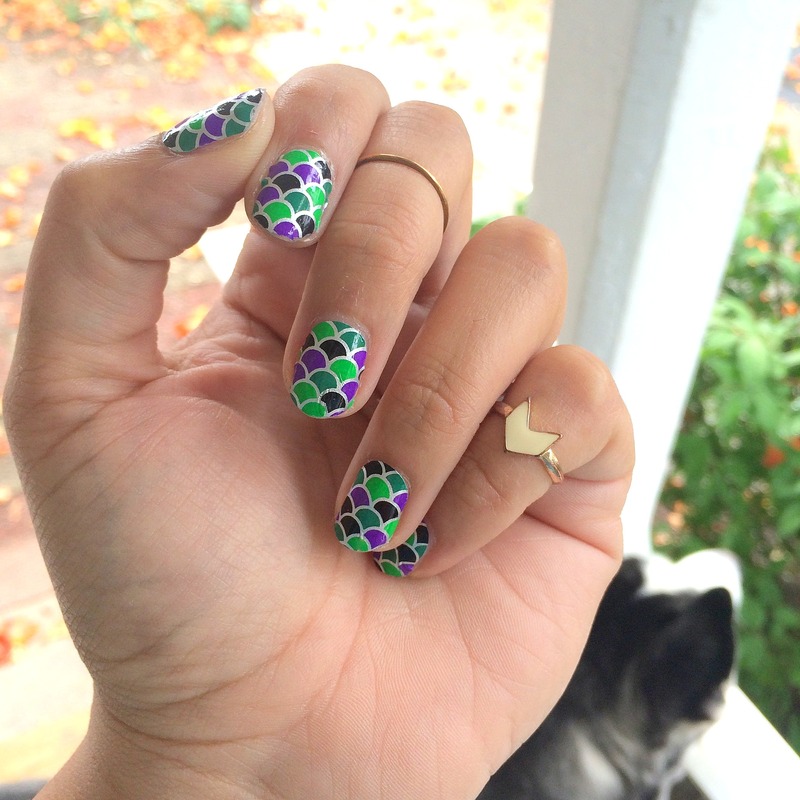 More nail wraps! 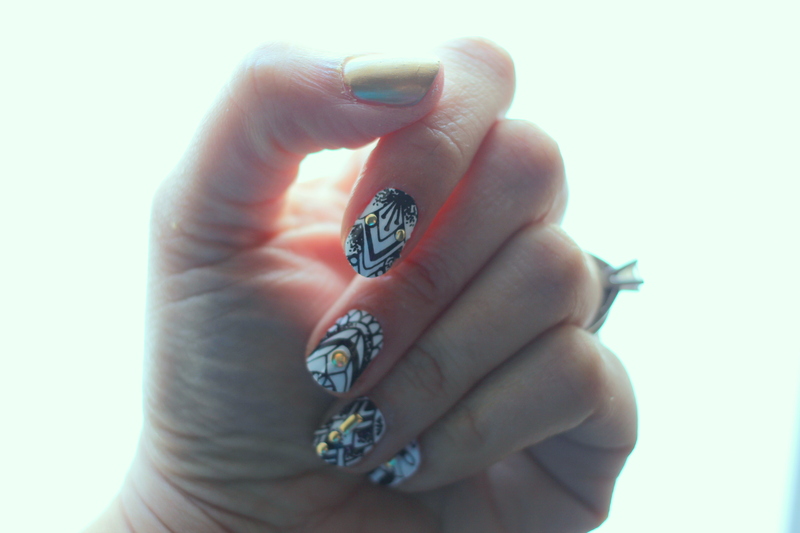 This time, I added a little embellishment by attaching some gold nail studs. These are the Divine Dotwork wraps from Scratch, designed by a tattoo artist. 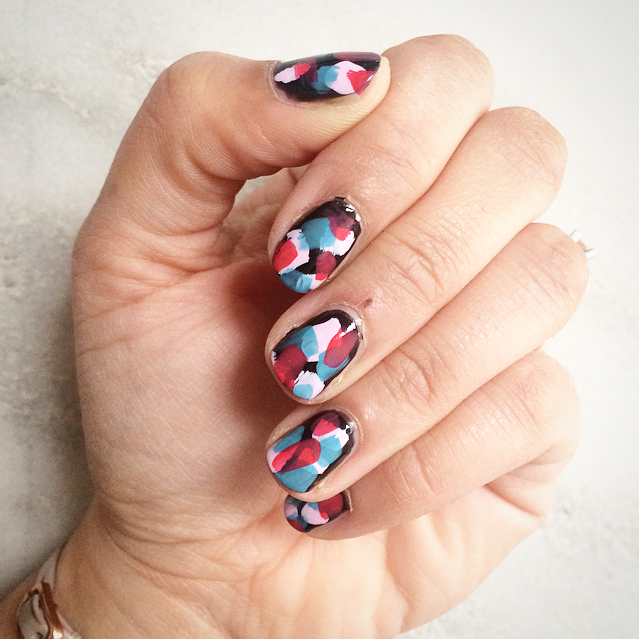 I love them – I’m kind of a sucker for black and white nail art. 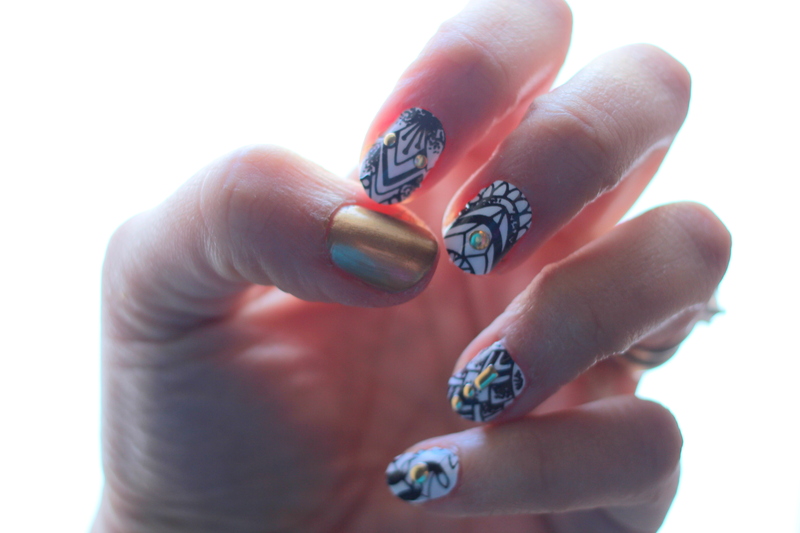 After applying the wraps, I added a variety of gold nail studs (from born pretty store), on each nail. 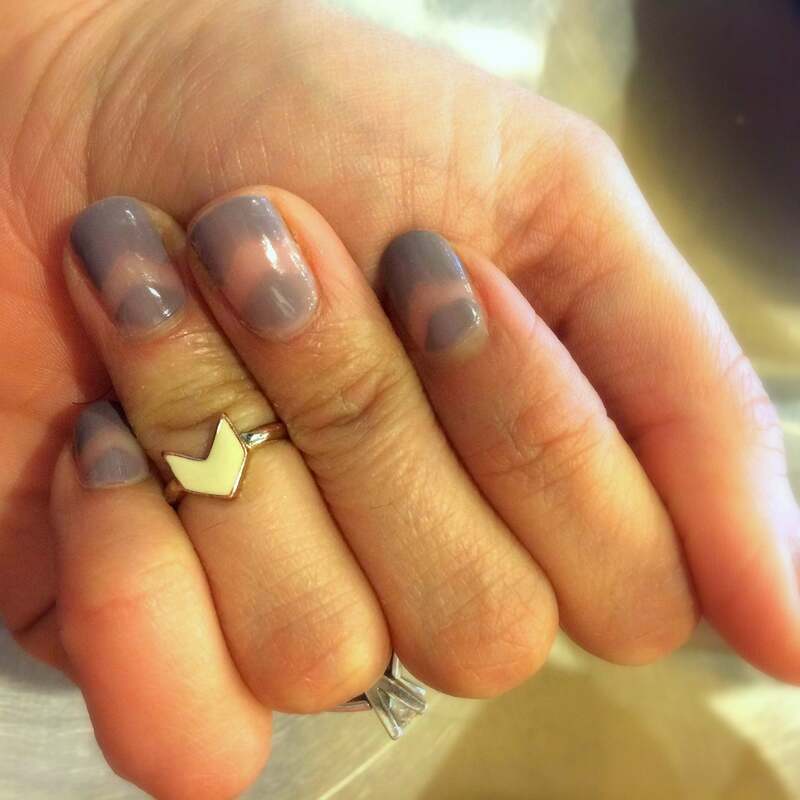 I painted both thumb nails gold (using the color Savoy by Julep) and kept them free of studs. I’ve had that Taylor Swift song stuck in my head all day today, and the title of the song just seemed to go so well with this week’s mani. To create the design I put the manicure guide stickers on top of my nails (which I had already painted with a base coat). I then painted over them with two coats of Chinchilly and removed the stickers ASAP. Lastly I painted over everything with a top coat. NExt time I’ll get better photos! Merry Christmas Eve! 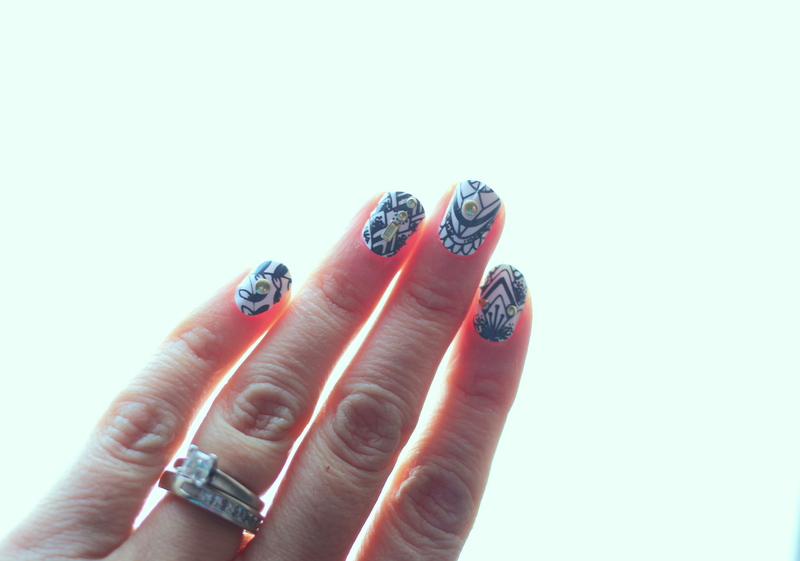 Just stopping in to share a quick shot of the fun wraps I’ll be wearing on my nails for Christmas. 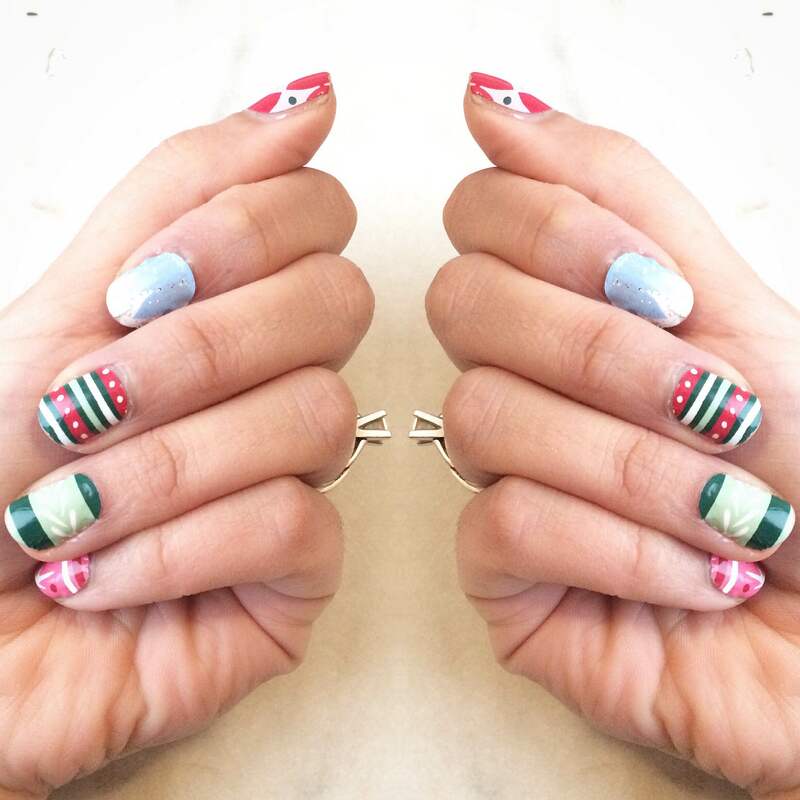 They were part of the December Monthly Mani Box from Scratch, and are called Ornamental Touch. 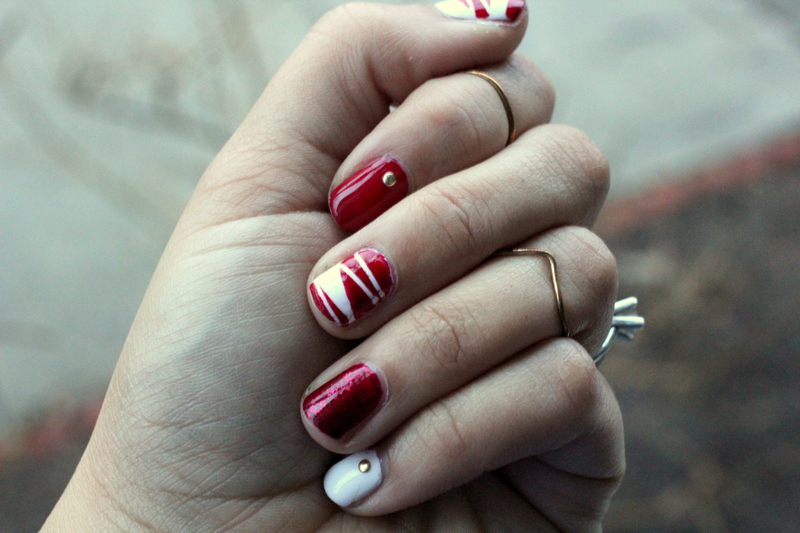 They remind me of ugly Christmas sweaters (in a good way). Has everyone finished all of their Christmas preparations? I think I’m done, finally. Can’t wait to see lots of family over the next few days! 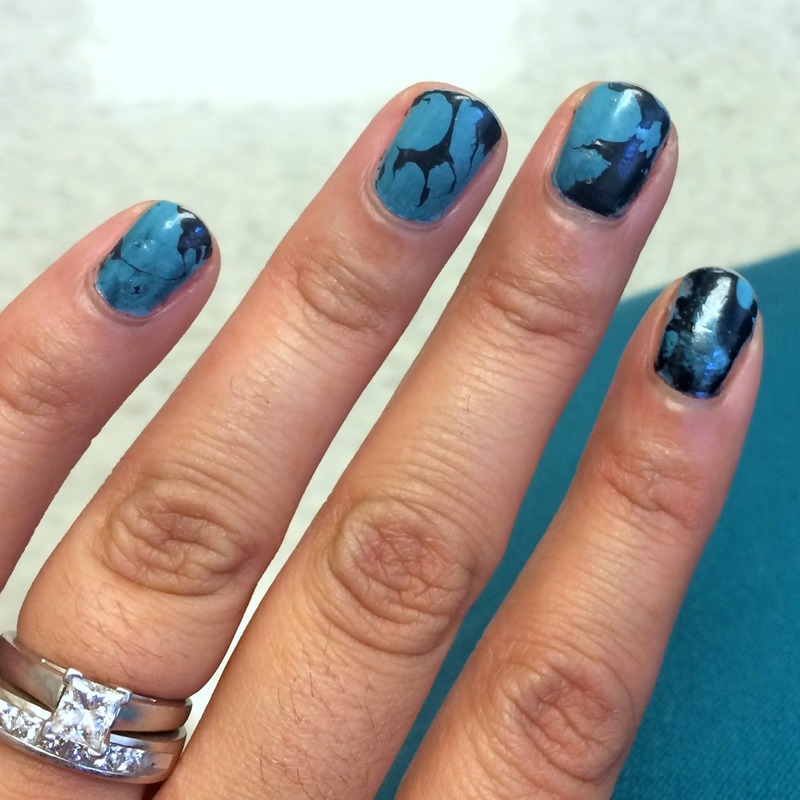 Another water marbling manicure, this time made to look like turquoise. One of my favorites! To get the turquoise look, I painted my naiels with a base coat of a turquoise polishes, which I sponged onto my nails to get a hint of an ombre effect. I used China Glaze For Audey and OPI Can’t Find My Czechbook and a cosmetic sponge (you can find a description of the technique here). 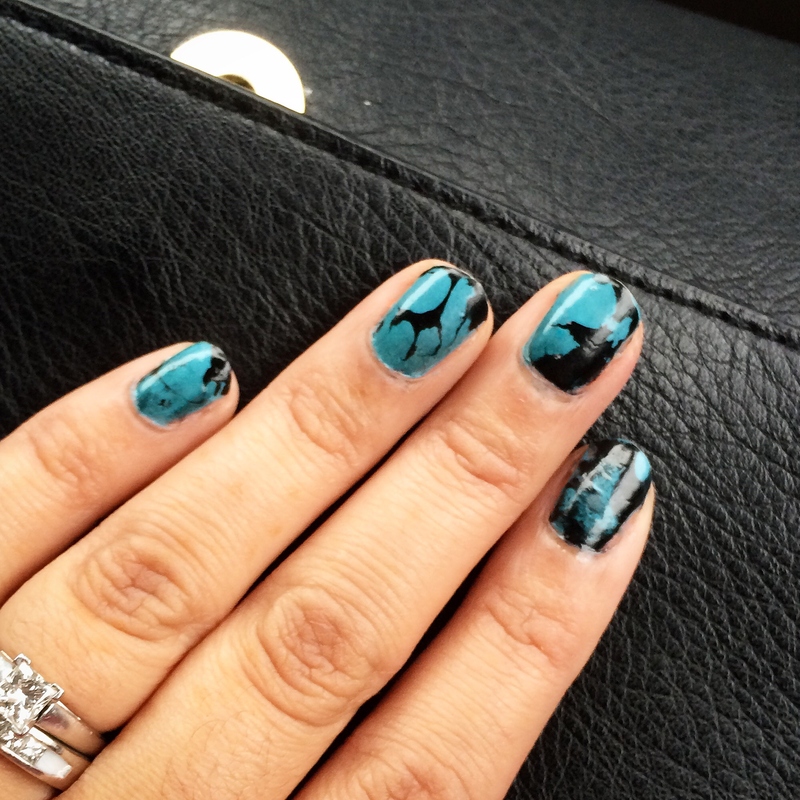 Then I dropped some black polish (Essie Liquorice in this case) into a cup of room-temp water and used a hairspray and this water marbling technique to get the effect. 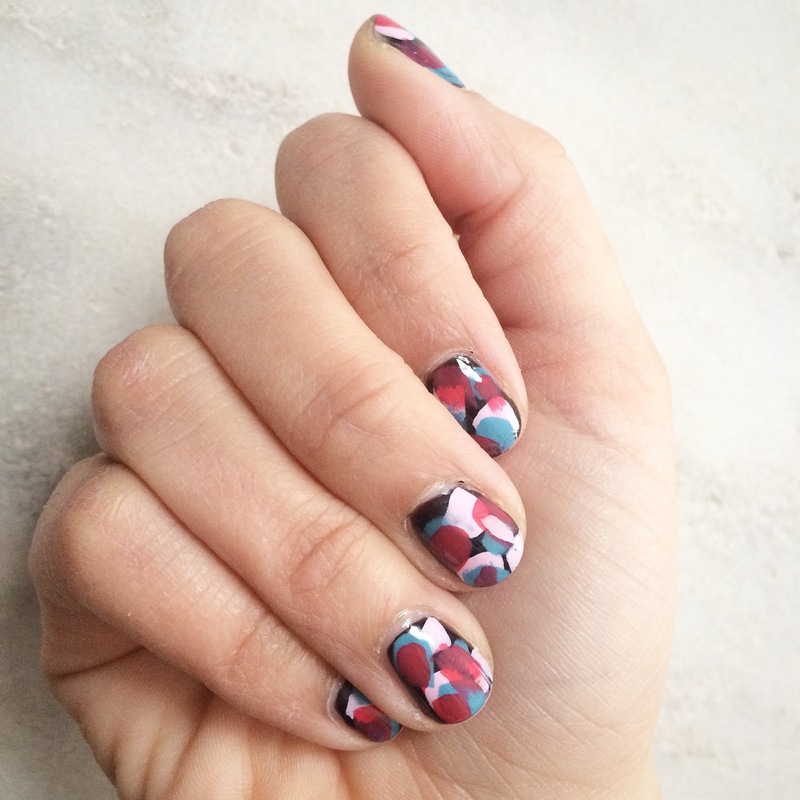 Thinking of using this technique to create a tortoise shell mani next!